This weekend will mark the first Sunday of Advent. For those of you who are not familiar with Advent traditions, this is a celebration during the four Sundays preceding Christmas. In many churches an Advent ceremony will be marked by the lighting of a candle. This is especially enjoyable for children as anticipation and excitement grows for the celebration of the coming of the Christ Child. Churches that celebrate Advent have different traditions for each Sunday. I would like to offer an Advent Meditation for each of the Advent Weekends leading up to December 25. So, all you Grinches, time to get in the Christmas Spirit! The 1st Sunday of Advent lights the Prophet Candle. We remember the prophets of old, who demanded to be heard, who dared to speak of a child to come, an unexpected liberator of the people, the vulnerable incarnation of the Holiest of Holies, the very Word of God. The worst human life is to exist without hope. It is to assume that the future is bleak and bleaker, and that things will never get better. It is to focus on chronic pain, departed loved ones, and lost opportunities. When you hear the Christmas bells, don’t think of city sidewalks or a one-horse open sleigh. Think of the God who loved you so much that he sent his son to die for your sins. He is not dead. He is not asleep. This Sunday, as we ready our hearts for Christmas, may we pray that God will lift our gloom and give us hope. May we pray that the light of God will shine brightly on our paths, a life-giving light, a beacon of hope. One of the pleasures I gain in attending the Evangelical Theological Society meeting each year is to see a few of my old teachers. This year I heard Douglas Moo, my teacher at Trinity Evangelical Divinity School. In my classes at TEDS, I often served the role of non-Calvinist punching bag for my Reformed fellow students, and this occasionally included professors. I had a class on Romans 9-11 from Dr. Moo, and although Reformed theology runs deep in his doctrinal veins, he never treated me with disrespect or allowed other students to do so in class. Consequently, I learned a great deal from him. Later, as the Director of TEDS Ph.D. studies, he sat on my doctoral dissertation defense committee and made incisive comments concerning the project itself. Dr. Moo has since gone to Wheaton College to become one of the most respected New Testament scholars of his generation. He serves as the current chair of the NIV translation committee. This is one of the reasons I have great faith in the NIV2011. No one who knows Doug Moo would question his personal or scholarly integrity. 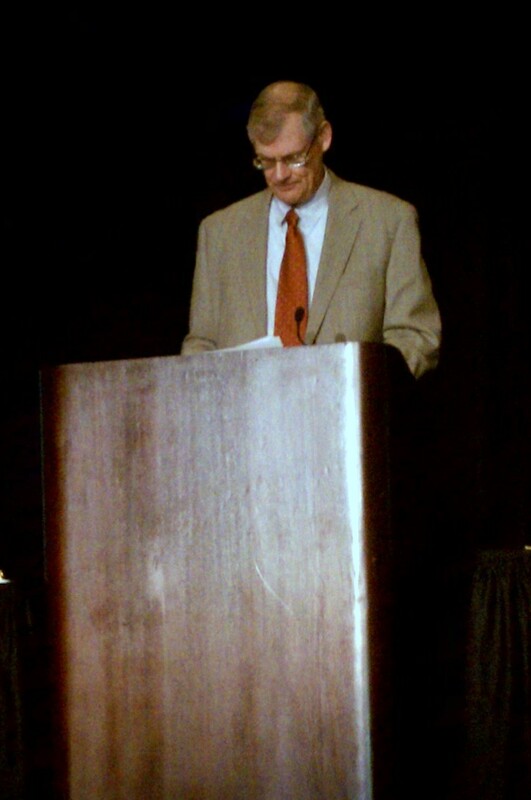 I’m glad I heard Doug’s plenary address at the ETS concerning “Creation Care,” which was a wonderful commentary on the interlocking role of the Bible, exegetes, theologians, and practitioners in a Christian debate about care for the environment. You can watch the address at this link, Dr. Moo’s talk starts at about the 1.00 mark. This year, Advent does not begin immediately after Thanksgiving, so I am taking some extra time to pause and be thankful for various things in my life. One of these blessings is the great teachers I have had. This includes Richard Owen (who gave me a high respect for the Old Testament), Beauford Bryant (who showed me how a great scholar could be a great preacher), Fred Thompson (who taught me that systematic theology was a worthwhile discipline), D.A. Carson (who patiently helped me learn to be a critical and careful scholar), Kenneth Kantzer (who showed me that the Restoration Movement had its roots in Reformed theology, that in many ways John Calvin was our theological father), Walter Kaiser (who showed me that it was OK to have fun in the classroom even when talking about very serious matters), and Carl F.H. Henry (who taught me what was at stake in the so-called “culture wars” of the 1990s). God is exalted in his power. So thanks to Doug, Richard, Beauford, Fred, Don, Kenneth, Walt, Carl, and many others. Most of all, thanks be to God who teaches me new things every single day. This is a climactic moment in the book, a glorious seven-fold hymn lifted to God. When they sing blessing, it is a sign of praise. When they sing glory, they are referring to the personal splendor of the Lord. When they sing wisdom, it is a recognition of God’s intellect. When they sing honor, it is an expression of the great esteem they have for God. When they sing power, it is a submission to the authority of the Lord. When they sing might, it is a recognition that all strength and empowerment flows from the one seated on the throne. And when they sing thanksgiving? What do they mean when they sing that thanks must be given to our God forever and ever? This is the central term in the hymn, the climax of the climax. The thing that amazes me most here is the idea that the citizens of heaven are still involved in giving thanks to God. It does not stop when we get to heaven. There is a well-known coach who has a motto, “Win Forever.” Isn’t that the theme of Revelation: we win, we win forever. And part of that is we give thanks, we never stop giving thanks? Salvation belongs to our God who is seated on the throne, and to the Lamb! The idea of a government-recognized holiday of national Thanksgiving seems a bit puzzling to me. If we have erected a strong wall of separation between the communities of faith and a secular government, how does this work? I have written in the past about the experience of one of my daughters who came home from first grade with some Thanksgiving-inspired classroom art, crayoned Indians and Pilgrims. I asked her to tell me what she had learned about Thanksgiving in school, and she said it was a feast the Pilgrims gave to thank the Indians for helping them. For one of the few times in my life, I contacted a teacher and asked her what was up. This woman was a Christian and knew perfectly well that the “thanks to the Indians” explanation for Thanksgiving was a recent fabrication and accommodation, but she was basically afraid to say anything else in a public school. I advised her that I would prefer she not say anything than teach my child something that was not true. A few years ago, I visited Plymouth Plantation near Boston with that same daughter. It is actually a sad place, where many, many people died from cold and starvation. The Pilgrims were sectarian Christians who sought a place to build a community where they could practice their faith without government or established church interference. I doubt if many of them knew how hard this would be, that their fathers, wives, and children would die within a few months. I can also imagine how overwhelmingly thankful they were after their first successful harvest, knowing they had enough food to last the winter. Were they grateful to the friendly Native Americans who had helped them? I’m sure. But mostly, they were thankful to God, their eternal Father, who had provided for them. It was a great reversal, for I doubt that many felt like offering thanks in the previous winter when they were starving and watching people die. So, can we really take time to thank God on Thursday for all the blessings in our lives? Can we count them one by one? Can we pause the football games and hesitate in the feast truly to thank God for what he has given us? And maybe the public schools could do this. It is too much to expect them to teach children to be thankful to God, I realize. 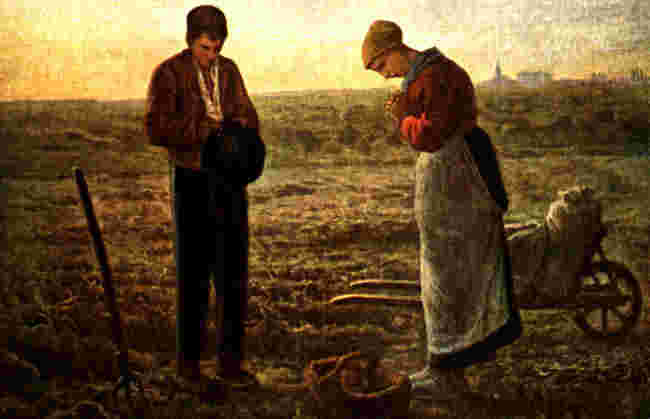 But could they teach an accurate bit of history, that nearly four hundred years ago there was a small community of European Christians, trying to carve out a village on the inhospitable Massachusetts coast, who thanked their God as an act of faith, and set aside a time to rest from their hard labors and eat heartily as a community of faith? I was at First Christian Church in Champaign, IL (where NCC grad Jason Epperson ministers) yesterday and they showed a little video called the “Thanksgiving Chair.” If you haven’t seen it, check it out. In the interpretation of the book of Revelation, there is a very old school of thought known at the “Preterist” position. “Preterist” is a Latin based term that basically means “past” or “in the past.” To interpret the book of Revelation this way is to view it as primarily a commentary on events in the lifetime of the author. More specifically, this sees the book as a coded critique of the first century Roman Empire and the suffering it has caused in the church. This does not rule out that some sections of the book are future referring prophecies, but does stand in opposition to the “Futurist” view, that sees all of the book from chapter 4 on as speaking of the events of the end of time. For example, the “Beast” of chapter 13 in a preterist view would be seen as a Roman Emperor from the first century (perhaps Nero). In the futurist view, this Beast would be a future, yet-to-be revealed figure at the end of time. Futurists have had great fun speculating that a person in their day is the Beast. Suggestion have included dolf Hitler, Henry Kissinger, Mikhiel Gorbachev, and (more recently) Barrack Obama. These guesses generate interest, but look silly after a few decades. There is a small but determined group of Christians who have adopted the name “Preterist” and applied it across the entire scope of Scripture. A view that was originally descriptive of interpreting the book of Revelation is now used to interpret the prophecies of Jesus concerning the destruction of Jerusalem in A.D. 70 and his second coming. At the extreme, these folks say that this catastrophic destruction of the Jerusalem temple in A.D. 70 fulfilled the prophecies of Christ’s second coming. We do not need to look forward to Christ coming again, this was done over 1900 years ago. In teaching Revelation last year and preaching it at the Winema Week of Missions last summer, I have talked about this new preterism (what I call neo-preterist). The usual response: people can’t believe this is a serious position within the Evangelical community. 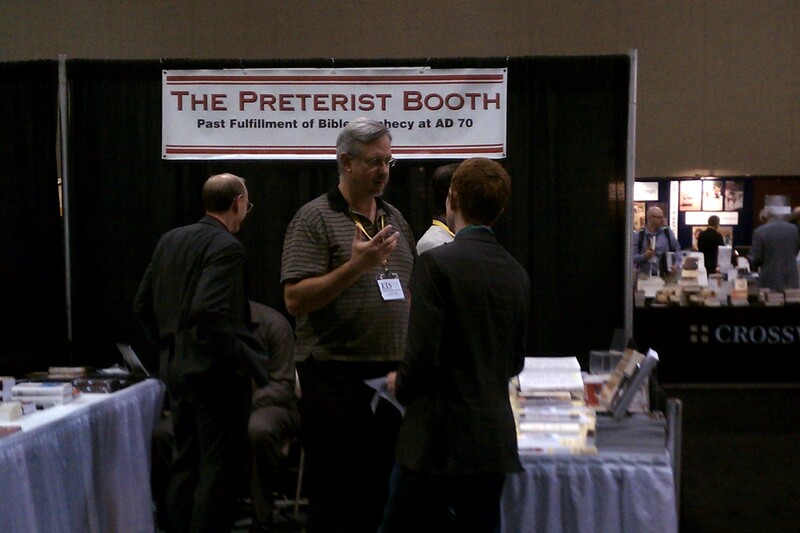 For you disbelievers (including my students) I have included a picture of their booth at the Evangelical Theological Society meeting in Milwaukee, where I am today. I did not just make this stuff up. 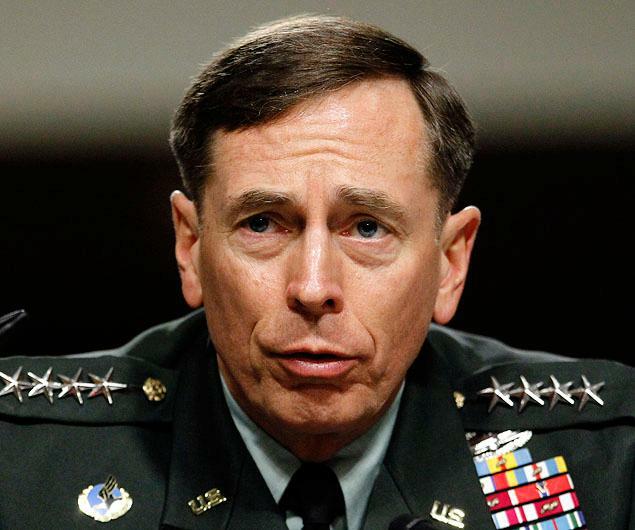 I have been deeply saddened by the quick and absolute fall of General David Petraeus. I think a case could be made that Petraeus was the most respected man in America. He was a hero of both the Iraq and Afghanistan wars whose advice was sought and followed by both Presidents Bush and Obama. He seemed to rise above the partisanship of Washington, D.C., and serve his country, most recently as the Director of the Central Intelligence Agency. It would not be a stretch to imagine that he could have been a legitimate candidate for President in 2016, and had he declared that intention, I think he might have been considered the favorite. Petraeus was not always popular with his fellow generals and admirals. One reason he seemed to understand that a foundation of our republic was that we have elected, civilian leadership that has ultimate control over our military forces. He made his case for large surges of troops in both Iraq and Afghanistan, but followed the more limited decisions of his Commanders in Chief in both cases without public comment. And lest we think the military commanders should always be given whatever they want, we might remember that General MacArthur wanted to use nuclear devices in the Korean War. It took a former military man turned President, Harry Truman, to realize that this would have led to a world where nuclear war was not unthinkable, but just another battlefield tactic of horrific scale. This is a sad day, and I am sorry that it has come during our respectful celebration of Veterans Day, honoring those who have served this country in the armed forces. I am not a veteran, but I had a father and five uncles who were, and I understand their sacrifice a little. My Uncle Vale contracted malaria while serving in the South Pacific and suffered from it for the rest of his life. My Uncle Verne served in the Battle of the Bulge and suffered from battlefield trauma for the rest of his life. These men willingly served for their country at great personal cost. What happened to David Petraeus? I don’t know. My guess is that he suffered from the hubris that often comes with great accomplishments and acclaim. I’m sure we will get more information than we want in coming days. Petraeus enforced the rules with consistency and violated them himself at the same time. He maintained a facade of honor but lived a lie. Et tu, Petraeu? The class I am teaching at Nebraska Christian College is working on the book of Hebrews right now. We have been walking through the opening statement of the book, perhaps the most remarkable and densely stated piece of christological theology in all the New Testament. I am pounding into my students that Hebrews makes up a unique and indispensable part of our understanding of Jesus Christ, and without this book, many important doctrines would vanish. It is unlike Pauline theology in many ways and gives us an important balance for the writings of the Apostle from Tarsus. Since Evangelical theology is currently over-influenced by Pauline thought and under-represented by the doctrines of the Gospels, James, and Hebrews, I believe that paying attention to Hebrews is important, even crucial, for an adequate 21st century doctrinal playbook. In the original text, it is not “his Son” or “the Son.” There is no article. God has spoken by Son. Not in bits and pieces, like he did to the ancestors (the biblical nation of Israel). Not through lots of spokespersons (the prophets). Not by using lots of revelatory methods (dreams, words, events, etc.). One person: Son. One method: Son. One revelation: Son. The advent of the Son is not the penultimate revelation. It is the final, complete, all-sufficient, fully-adequate, ultimate revelation for these last days, the final period of human history. I do not doubt that when the end comes, the close of human history, God will more fully reveal himself in power, glory, and judgment, but not now. The revelation of God through Jesus Christ is both all we get and all we need. We don’t need another testament added to our Bibles as some now suggest. We don’t need another book of revelation, a Qur’an or a Book of Mormon. We don’t need a new oracle to speak for God, whether a Bishop of Rome or a Dali Lama. Christ is both the perfect revelation of God and the culmination of all revelation. God’s Son is both a person and a method of revelation, and he has spoken to us in a wonderful, unequivocal, and sufficient way in his words and in his life. 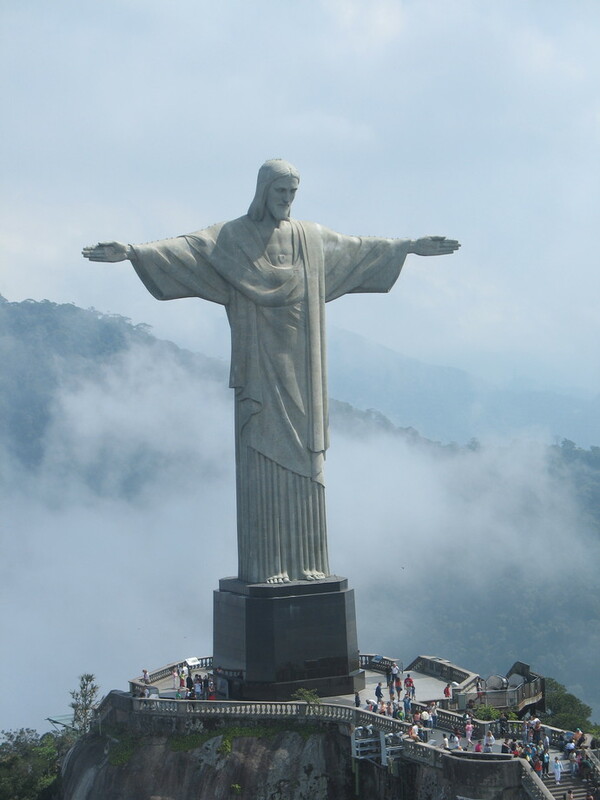 Christ is all we need and all we are going to get. That, my friends is Giant Theology.